Over the weekend, I managed to run a whopping 13.3 miles (that’s a tiny bit longer than a half-marathon, or Pikermi, as some call it). It was definitely hard, but I did it! I ran a route that took me through town, so I was dealing with traffic, and a number of different surfaces- trails, asphalt, concrete. Now that I know I can do it though, I’m going to think about when I’d like to do the half-marathon as a race. There’s a marathon and half-marathon in town coming up May 1, but The Odd Couple is closing the night before that, so the likelihood of me being properly rested for it is pretty well nil. There’s several others coming up though that I can consider, and lots of shorter races- I’m already committed to doing a 5k Fun Run on May 29, and another 5k in July, and I can always do some 10k races here and there. I’ve been doing a little bit of running crew work for The Odd Couple, which is going into its final week of the run this week. It’s a good show! I wish I could watch it properly, but I’ve been pleased to get to work on it in a backstage capacity. I’ve gotten to meet some great new people, and hang out with others I had already met but didn’t really know. Good stuff! This past weekend, we sang Bach’s St. John Passion. The concert went really well. I don’t find myself enjoying St. John as much as I did St. Matthew, music or text-wise, but it was still quite good. Rufus Müller was fabulous as the Evangelist, as expected, and the turnout was pretty good. Next up will be the Chamber cabaret concert on May 7, and then singing for Holst’s The Planets with the KW Symphony. Should be good. I voted at my advance poll last Friday, because May 2 will be a little too busy for me to drive across town 2 extra times in order to get to my polling place. It is my first federal election as a Canadian! I was excited to finally get to vote in the country where I’ve lived for the past 6 years. We’ll see how the election turns out- the reports thusfar are quite varied. Last week and weekend was pretty awesome. I got to do a bunch of cool things. Last Thursday, I went to a Guster show in Toronto (Guster being my favourite band of all time). They played at the Phoenix Concert Theatre– they’ve played there before and I believe we’ve been there for other shows as well. It’s a nice venue, I appreciate the balcony, because I am often too short to see anything at club shows. Anyway, the show was good! The opening band was seriously awesome. They’re Jukebox the Ghost, who I hadn’t heard of before, but I have quickly become a fan of their music and their little ghost logo. I like their songs, and appreciate the use of keyboards/synths and harmonies and yeah, they were a pleasure to watch. This was the first show of the tour, apparently, and the first couple songs in Guster’s set had a bit of that first-show grit to them, but things cleaned up quickly and the show was awesome overall. We got an actual encore! I haven’t been to many shows that went beyond the clearly-orchestrated encores. The club wasn’t as packed as the last time they played there, which I actually liked because it meant I got a spot on one of the couches instead of leaning awkwardly against the wall. Maybe that means I’m getting old. 🙂 Though I’m sure the bands would have appreciated more tickets sold. Anyway, it was a good show, and both bands are highly recommended. 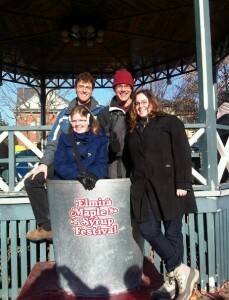 On Saturday, at stupid-o-clock in the morning (or whatever time it is that exists before 7am) I went with some friends of mine to the Elmira Maple Syrup Festival. It was only my second time going, I went for the first time last year. It seems that the key is to go really early (before 7) or really late (11) in order to avoid a ridiculous line for pancakes. We got there just after 7 and there was a line, but it wasn’t bad. It was really fun! 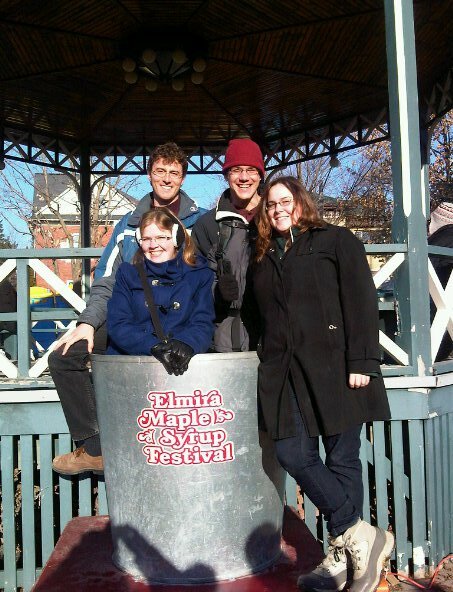 We got pancakes, and I bought some summer sausage from Kitchen Kuttings (my favourite summer sausage in the world, seriously) and we I got some syrup and red pepper jelly, and got dumped into the world’s largest sap bucket for a photo, which was pretty great. I had a lot of fun! The weather was really good, which helped a lot. I finally went to see KWLT‘s production of Frankenstein, and had a great time. I was there as an usher, which got me a free seat, and I definitely enjoyed the show. I particularly thought the Creature was really well-portrayed- I was scared and found his plight really compelling at the same time. I was there closing night, so I got the benefit of crashing the strike party after as well, which was a great way to end the day. This weekend, I’m bottling two batches of wine- one is a particularly awesome Gewurztraminer-Reisling, and the other a blend that I don’t remember, but I heard good things about. So I’m looking forward to that! I’m also going to a outreach event for choir, essentially an open rehearsal where people come and sing with us on some repertoire we’re working on (currently the St. John Passion). Plus, the weather is supposed to be warm, so I’m excited!